ASUS offers a full spread of components on the M4A89GTD Pro, you get Realtek’s 8111E LAN (PCIe), Realtek ALC 892S audio (complete with the DTS Surround Sensation package) and a couple of NEC fired USB 3.0 ports. It’s an adequate bundle, but we’d like to have seen a USB bracket added to make use of the internal USB headers. 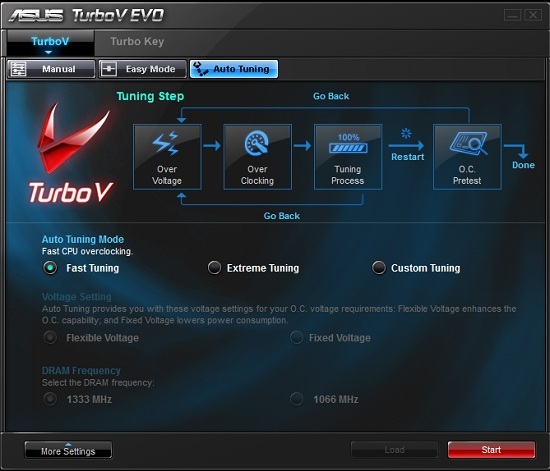 On the bundled software side, all of the regular ASUS tools are supplied with the M4A89GTD Pro; Express Gate (Linux based OS), AI Suite (overclocking and fan control), PC Probe II (temperature and voltage monitoring) and ASUS Update (OS level BIOS flashing). We’re told ASUS is looking at combining some of these tools into a single package in the near future – it’s a change that’s long overdue. Most of the software tools that manufacturers provide with boards these days are nothing more than bloatware that serve little purpose. In fact, we’d prefer it if vendors fed us less fluff and spent more R&D time on motherboard functionality rather than creating another source of potential problems. We were introduced to this tool earlier this year when we reviewed the P7H57D-V Evo, and we liked it a lot. You get the same thing here on ASUS’s AMD board, delivering no-fuss overclocking with a decent level of flexibility. Users can set tuning criteria to suit their system and will find the automated routines end up at bus frequencies that are well aligned for 24/7 use most of the time. There’s also the option to push further if you’re components/cooling allow by selecting the extreme preset. The software runs a quick stability preset, hikes the bus frequency by a few MHz and then prompts you for approval before continuing – the whole package is put together very well by ASUS. This is where ASUS get things spot-on for our liking, the BIOS is well laid out, easy to navigate and comes crammed with a multitude of performance options for every type of usage scenario. Voltage options for all primary rails are very granular and also allow direct-entry so you don’t have to scroll up and down through most of the voltage table to select the setting you want. Another area where ASUS get it right is in the area of memory sub-timings and drive strengths, every option has its own AUTO setting allowing users to fall back on defaults when necessary. The one area we’ve found to be a little wanting is overclock recovery, we had to switch off at the PSU quite often to encourage ‘safe mode’ to engage during overclocking. We’ve come to expect a little better from ASUS in this department over the years, but it looks like BIOSTAR have the upper-hand in this area at present on their boards. BIOS flashing is made easy via a built-in routine that allows upgrading from a USB drive, HDD or DVD. ASUS have also gone to the length of ensuring that the BIOS flash software only runs if the system is at default settings and not overclocked, which should prevent a few corrupt BIOS flashes when users are a little careless. We’re often asked by users to provide information about motherboard fan-control when we discuss board features. 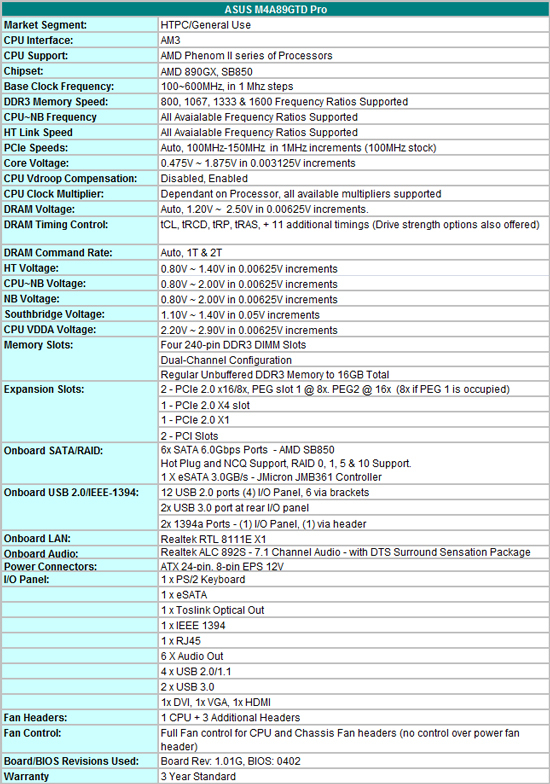 Its pleasing to report that ASUS offers very comprehensive fan speed control via BIOS for three onboard fan headers. Most boards at this price point struggle to provide you with anything more than control for the CPU fan header, so we have to commend ASUS on going a step further - we’d like to see more of this please! Should clarify - I do not add GPU PCIe power draw because that is a separate entity from board consumption really. It's drawn from ATX 12v on most boards so is easy for me to factor out. In hindsight I should have - I'll be sure to do so in future. They still come with the cage, I uninstalled it to mount the Corsair H50 cooler. So yes, some coolers do not use AMD's mounting plate.. I wish all the motherboard reviews were this detailed.. Good Job! does anyone know if the heatpipe below the chipset heatsink directly touches the HD 4290 IGP core?